If you still haven't decided to attend the Sustainable Landscaping Conference in Lancaster, Pennsylvania starting tomorrow, here's another reason to make the trip. Thomas Rainer, DC area landscape architect, gardener and blogger, will be giving a talk entitled "Hot or Not: How Making Sustainable Landscapes Fashionable will Revolutionize the Movement." I'm a big fan of Rainer's blog, Grounded Design, and have mentioned it several times on this blog. 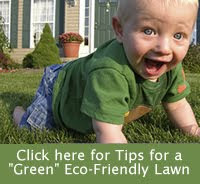 Registration is still open for the 2011 Turning a New Leaf sustainable landscaping conference on Friday, December 2 in Lancaster, PA. This conference is organized by the Chesapeake Conservation Landscaping Council and offers a great educational program with · Four tracks: Every Design Counts, Every Drop Counts, Every Plant Counts and Every Message Counts · An EcoMarketplace, featuring local organizations and green businesses · A networking reception Lancaster is also a wonderful destination for an early December weekend away! Registration is $119 and includes all sessions, snacks, lunch and entrance to EcoMarketplace and networking reception. For more information or to register, visit www.chesapeakelandscape.org/2011leaf.htm.